If I’ve said it once I’ve said it a million times: Chickens are so cool! Did you know that every chicken has her own unique personality, and that chickens have such a huge range of vocalizations that they literally “talk” to each other? And their eyesight is so keen they can see things we simply can't see. Plus they've got a complex social structure and each chicken understands where she fits in. And yet, in spite of all this and all their inherent coolness, most chickens are treated cruelly. OK, I know. You’re maybe starting to roll your eyes just a little bit, aren’t you? You already know that I’m winding up to preach one more time about the immorality of factory farmed laying hens living out their lives in battery cage torture chambers. You’ve heard the message from me many times before. You already get it. And you would like to move on to some stories about the Hipster Hens living happy lives. Well, here’s some good news. This time I’m actually winding up to tell you that a couple of folks have found a new method to advocate for chickens and tell the “chickens in cages” story in a fresh, engaging, and whimsical way. 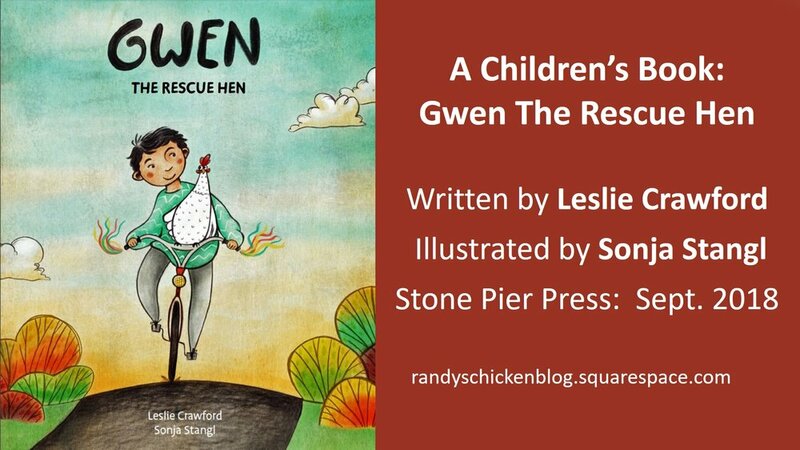 The folks I’m talking about are author Leslie Crawford and illustrator Sonja Stangl, and their “method” is their new children’s book, Gwen the Rescue Hen, due out from Stone Pier Press on September 19. The story is about a nameless battery hen living in a cage packed with other hens in a factory farm warehouse filled with a bazillion other hens. So far, this is a story that could be told once for each of the 280 million laying hens alive in the US right now. And that isn’t much of a story to tell– most of those 280 million hens are put into a battery cage at an early age. And because there’s no room to do anything in those cages except eat and poop and lay eggs, that’s what they do. They eat and poop and lay eggs until the day they die. End of story. The nameless battery hen in this story, though, gets to have a life-changing adventure. A tornado smashes into the building where she’s imprisoned and her cage is blown high into the air and far away. When the cage eventually comes to rest, it is so damaged that the little hen and her cellmates are able to escape into the world. When the hen sheds her cage, the story become an “innocents abroad” tale as she begins to parse out what it means to be a chicken and she learns that the great world is both wonderful and dangerous. Fortunately, a boy named Mateo rescues her from her wild existence, names her Gwen, and brings her home. And the story morphs to a saga of friendship. That’s a lot going on for one little battery hen—and since it’s a children’s book, it’s enough. We wouldn’t want the story to be complicated with too many incidental tales. But wouldn’t it be great if there were a sequel? I really want to know what Mateo and Gwen do next! It was a pleasure to read a book that "gets" chickens and promotes my ongoing message about their innate coolness. And I enjoyed the section after the story called "More About Chickens" that explains how cool chickens really are with a collection of facts, including the ones I related in the first paragraph of this post. Leslie Crawford has ably imagined and narrated the story of Gwen’s great adventure, and Sonja Stangl’s illustrations have perfectly captured the whimsy inherent in all things chicken. Together they show children, and adults that “happily ever after” is a real thing—and making it happen can be as simple as letting chickens live like chickens.